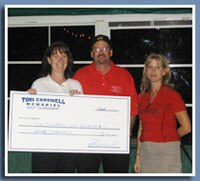 Tori Carswell Memorial Golf Tournament raises $18,000 for Ottawa NRF and Children’s Wish. On Saturday, September 4, a picture perfect day, the 1st Annual Tori Carswell Memorial Golf Tournament was held at the Canadian Golf & Country Club. 144 golfers gathered to spend a day with friends and family while honouring a special, young girl who passed away from cancer in January 2004. Golfers were also given an opportunity to win some fabulous prizes including a new Ford Mustang Convertible. At the end of the day a total of $18,000 dollars was raised for the Ottawa Neuroblastoma Research Fund and the Children’s Wish Foundation.